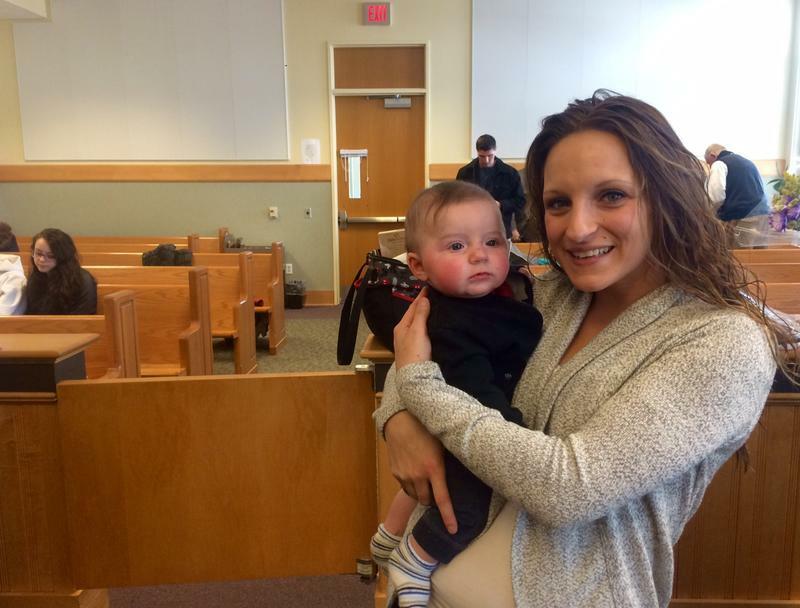 Kaitlyn Millette, 23, beams with joy while holding her son Brison after she graduated from Laconia's Recovery Court in February. Gov. Maggie Hassan has signed into law a bill to put state dollars into new and existing drug court programs across New Hampshire. 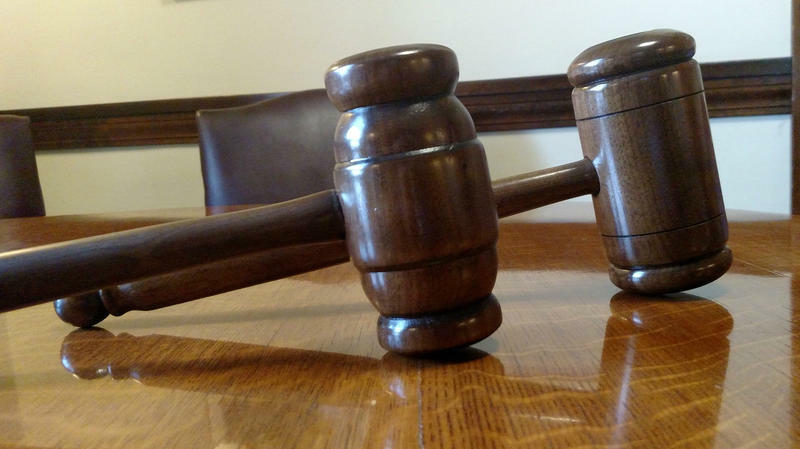 But for the past four years, Belknap County has been running its own drug court program without any financial help from the county, state or federal government. They call it recovery court and it’s under the direction of a judge who has placed compassion at the heart of the program. When you sit in the back of Judge James Carroll’s Recovery Court in Laconia, you won’t feel like you’re in court. “Do you have your phone?,” Carroll asked recent graduate Kaitlyn Millette, who just found out she might have complications with her pregnancy. “Yes,” Millette replied. “Make sure you are going to call her or get a hold of somebody here. I will close down the darn court, I’ll come pick you up – not sure you can fit in my little car though," Carroll said with a chuckle. If you didn’t know better, you might mistake Judge Carroll for a friend - he jokes with the participants, asks them personal questions about their kids and jobs and even attends events with them such as AA meetings. Carroll has been on all sides of the criminal justice system – defense attorney, prosecutor and now judge. And along the way he grew frustrated with seeing the same faces - people who were battling a drug addiction but not getting the help they needed. “I grew up in this community. A lot of the people who come in front of me I know. I know their history, I know their family, I know their grandparents,” Carroll said. That’s why Carroll teamed up with other community leaders to launch the county’s first drug court. Not calling it that though, Carroll said, is important. Instead it’s Recovery Court, a very intentional name that he and the volunteers agreed on in 2012. Carroll’s philosophy: When it comes to drug addiction - recovery is rooted in connection. 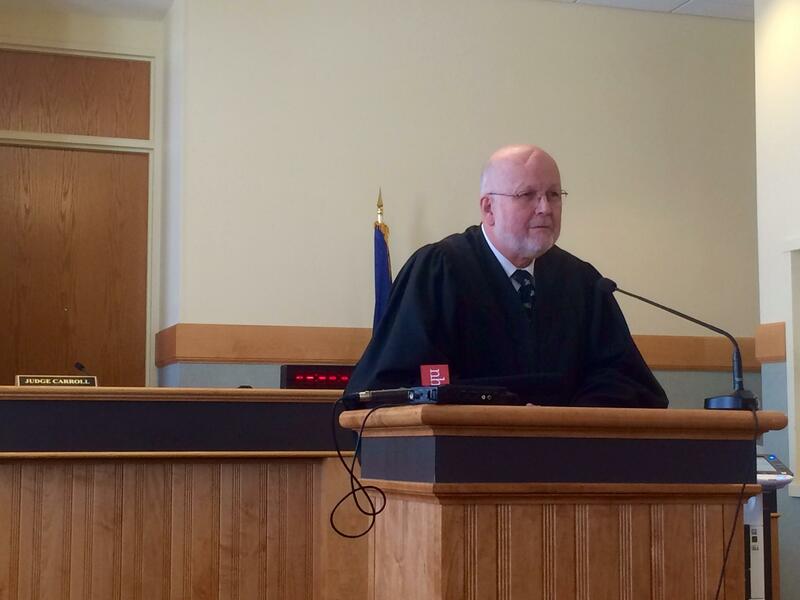 Judge James Carroll has built Laconia's Recovery Court around this philosophy: When it comes to drug addiction - recovery is rooted in connection. “I just think if a person knows that they care about you and they care enough to work hard with you – it changes your whole perspective on life,” Carroll said. Currently there are drug courts in Nashua along with Cheshire, Grafton, Rockingham and Strafford Counties. Most have used federal grants and county money to get started. And this past session’s bill on drug courts doesn’t guarantee that Laconia’s recovery court will see those state dollars. Belknap’s program is more or less structured like those other drug courts – participants are non-violent drug offenders. They have to undergo treatment, counseling, volunteer service and have weekly to monthly check ins in court. In exchange - participants don’t have to go to jail. Scroll down below to see the complete handbook for Laconia's Recovery Court. A total of 26 people have enrolled in the program, so far nine have graduated and 10 have been kicked out for breaking the rules. Overall the success rate is around 60 percent, which compared to national numbers is average. And besides the name, Belknap County’s program is run by an all-volunteer team who attend these weekly meetings during their lunch breaks. Because of this - only 10 people can be in the program at a time. Like Kaitlyn Millette who graduated from the program in February. “I can’t express how grateful I am for the many chances you allowed me to have. From the bottom of my heart I thank you for never giving up hope,” Millete told Judge Carroll while fighting back tears. Millette began using heroin at 15 but has been clean for two years. 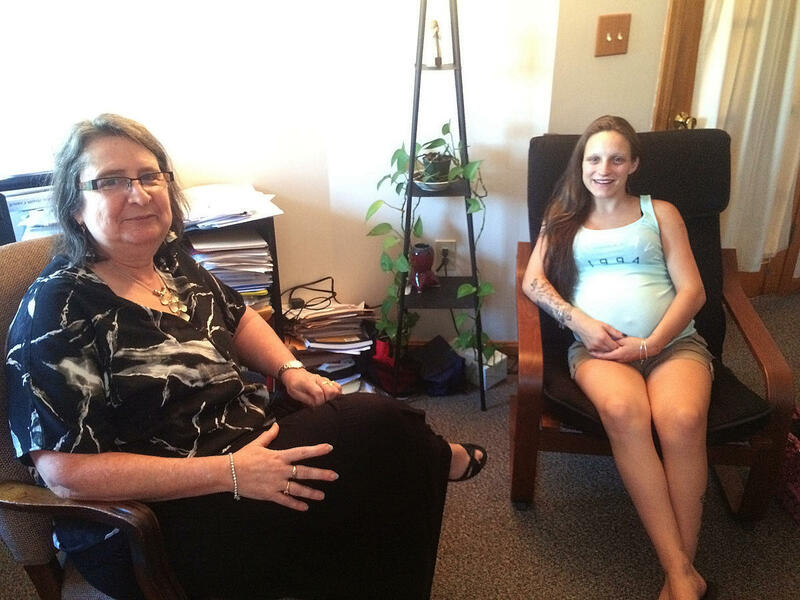 She’s working, just gave birth to her second child and soon to become a licensed recovery coach in New Hampshire. Standing proud at her graduation, Millette told the crowd that this program saved her life. Jacqui Abikoff, left, says the Kaitlyn Millette, right, she met prior to the program is a completely changed person. Since Millette entered the program, she's been clean for two years, and will soon start training to be a recovery coach in N.H.
Jacqui Abikoff of Horizons Counseling Center, who plays a major role in keeping this program running, said when it comes to addiction – recovery isn’t easy. And those involved in the program will be the first to tell you – Recovery Court is no walk in the park. Like when Judge Carroll learned participant Liz Gates skipped several meetings and appointments this past summer, he didn't hesitate to send her to jail for a few days. “Here’s the deal the court is going to incarcerate you beginning at 6 p.m. this afternoon. And starting at 7 a.m. Thursday morning, a new leaf in this effort, ok?,” Carroll told Gates from the bench. Belknap County Prosecutor Melissa Guldbrandsen said at first she was skeptical that the program would be too lenient, but now sees it's far from easy. 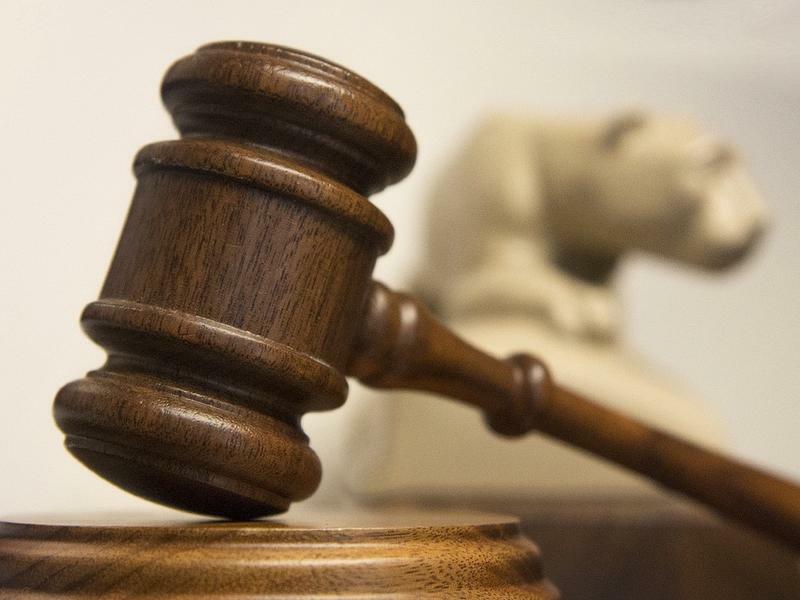 “The Recovery Court requires that they work hard, that they abide by additional rules and regulations in my opinion are more stringent that sitting in jail,” said Guldbrandsen, who also helps out with the program. The county's jail superintendent, Keith Gray, is on board as well. “I’m good at locking people up, I can lock them up all day long but they’re not staying there the rest of their lives, they’re all going to go back to their towns and their families, so just locking them up isn’t working,” said Gray, adding that three-fourths of the county jail's population has a substance abuse disorder. "From day one, I am not calling this drug court because I really think it sends the wrong message," Judge Carroll said. "To me it is the equivalent of saying this is losers court, this isn't losers court." As the recovery court graduation wrapped up this past February, Judge Carroll left the crowd with a story he’s told several times before, but one he said that’s all too fitting for the occasion. It’s about an older man who approached a young boy on the beach tossing starfish back into the water. As the state starts to divvy up the new drug court funding, volunteers at Belknap County are hoping some of those dollars will come their way so they can begin "tossing back more starfish." The idea of expanding drug courts in New Hampshire got an initial stamp of approval from the finance division of the state’s heroin and opioid task force on Tuesday and will now head to the full task force for further approval. A nonprofit group from Grafton County is expanding to support drug courts throughout New Hampshire as the state grapples with a rising heroin and opioid abuse problem. The Friends of New Hampshire Drug Courts, which started in Grafton County, will raise private money to help support the specialized courts that aim to get drug offenders into treatment and keep them out of jail. Currently there are drug courts in Belknap, Cheshire, Grafton, Hillsborough, Rockingham and Strafford counties. Hope on the Front Lines was a week-long series focusing on the people and organizations working to make a difference on the front lines of New Hampshire's opioid crisis. Produced by NHPR's Morning Edition team, host Rick Ganley and producer Michael Brindley traveled the state to meet people on the ground level of a growing epidemic, doing what they can to help in their communities.